Kickstarting their week-long strike against unpaid internships, students in the School of Community and Public Affairs and Journalism are joining about 35,000 student throughout the province. Disclaimer: The Link would like to acknowledge our paper’s involvement in this strike. Our Editor-in-Chief Miriam Lafontaine and Board Member and incoming Current Affairs editor Erika Morris helped lead the vote to strike. All articles concerned with the strike in Concordia’s journalism department will be handled by reporters outside the department. Ahead of the Coalition Avenir Québec’s first budget announcement this coming Thursday, students from the journalism program reiterated their demands to the provincial government to provide remuneration for internships. 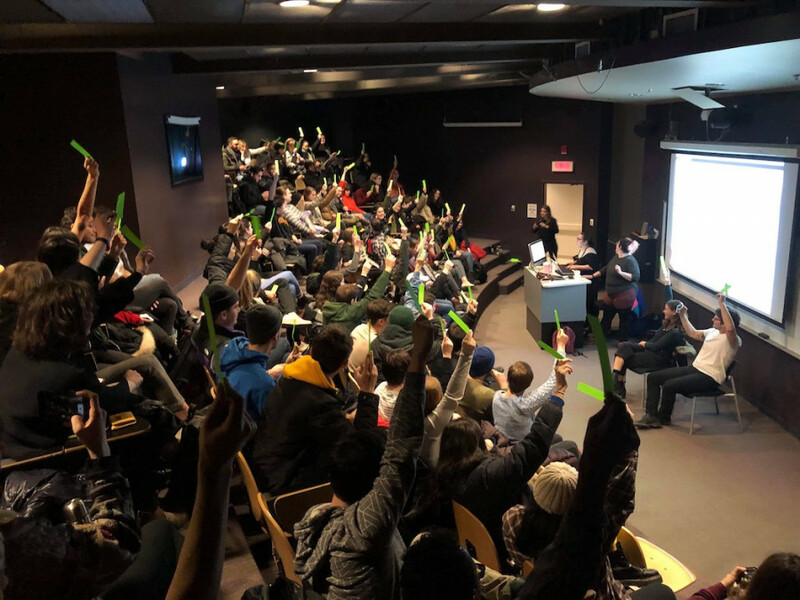 On Jan.16, approximately 35 undergraduate students in the Journalism department voted unanimously for a week long strike. In a press conference on Monday at Concordia’s Loyola campus, students from the Journalism program reiterated their demands. If the provincial budget doesn’t provide remuneration for internships, students on strike say that “further action” will be taken at general assemblies, set to take place this Friday. At the press conference, Sandrine Boisjolie from the Campagne sur le travaile étudiant said they want to meet with Quebec’s minister of labour, Jean Goulet “in the next few days” to find a solution to unpaid internships. “We don’t think students should be forced to accept this and students should not have to choose between building their career or paying rent,” said Miriam Lafontaine, Editor-in-Chief of The Link, and member of the journalism strike committee. Though students from journalism, as well as the SCPA, won’t be attending classes this week, David Secko, chair of the Journalism department, asserted that classes will run as scheduled, despite the vote. On whether students will face any academic consequences over missing class, Secko added that the faculty will “come together” to accomodate students as best as possible. “In a sense of consequences, no I don’t think negative ramifications will happen,” Secko said. Secko did not show any discontent over students skipping classes, rather, he supported the initiative. “I really do believe in them and I believe in their ability to make positive change,” he said. “From day one we’re teaching [our students] to get paid for their work if they can, to find opportunities, to find a career, because you won’t be able to sustain yourself if you don’t,” Secko continued. Along the with provincial government’s budget reveal, unpaid internship demonstrations are set to take place in Quebec City and Montreal this Thursday.